Everyone loves eating layered dips at a party. Why not bring the party to your lunch bag? These easy-to-make dips make the perfect accompaniments to your favourite veggie and cracker dippers. Mix sour cream and onion powder until blended. Spoon salsa evenly into 2 small containers with lids; top with layers of sour cream mixture, cheese and onions. Cover with lids. Refrigerate up to 24 hours before packing in 2 insulated lunch bags along with the vegetable dippers and crackers before heading out the door. These mini dips are just as fun to serve at a party. 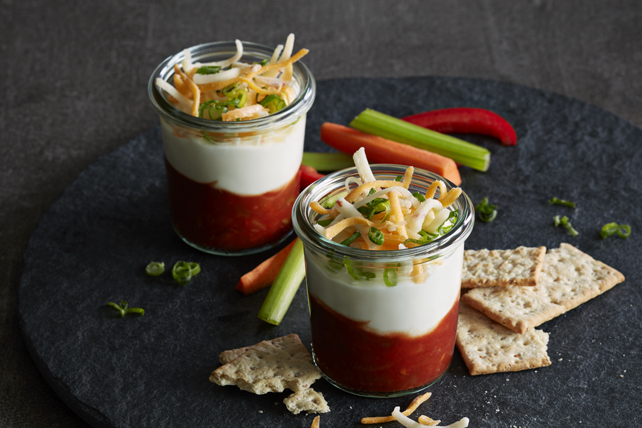 Increase ingredients as necessary so you have a filled dip cup for each guest. Then, let your guests grab and go. No worries about double dipping!